Assistant Professor of Art Chris Janzen, MFA, invites FPU community members to the opening reception of his exhibit Recent Works on Thursday, October 4 from 5-8pm. The Art Hop event will take place at Fig Tree Gallery, 644 Van Ness in Downtown Fresno, and will showcase a series of large scale paintings and drawings created over the past three years. Janzen's "Menno Pop Surrealist" approach to art-making combines objects and experiences from daily life resulting in dream-like compositions where imagery from advertising and social media collide. 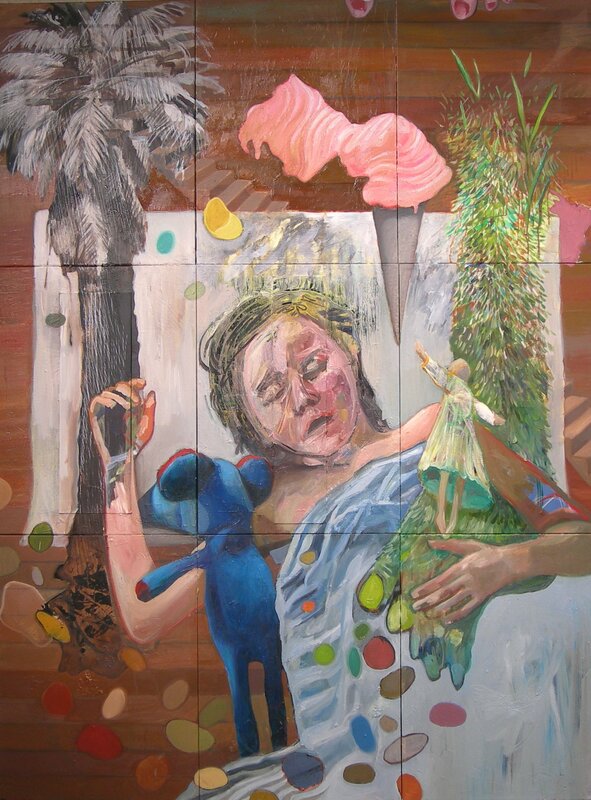 The painting Sick Kid, for example, renders the artist's daughter in the midst of a feverish dream-state surrounded by objects in various degrees of abstraction including a stair-case leading to a palm tree, a doll-like dancer, and a fuzzy green monster foot. Please stop by, ask Chris about his work, and enjoy refreshments on October 4! Fig Tree Gallery hours: 12-4pm, Friday, Saturday, and Sunday.